Home/Knowledge Base/FAQs/Does Squirrly SEO Plugin Have All the Google SEO Requirements? We get this question a lot and it’s a good thing we do. Same as you, we care about Google’s SEO requirements and we’re committed to offering you an SEO tool which will help you optimize your WordPress website properly. Long story short, yes, Squirrly SEO complies with Google’s requirements when it comes to SEO. In this article, we’ll tell you how we do it. The live assistant is the feature which helps you optimize your posts for both humans and search engines. It’s called the live assistant because it tells you as you type your article whether you’re doing a good job or if there’s something you need to fix. One of Google’s most crucial guidelines is making your pages primarily for users and then, for search engines. The live assistant helps you take care of this in the easiest manner possible. Tells you to use the keyword in the introduction of your post. 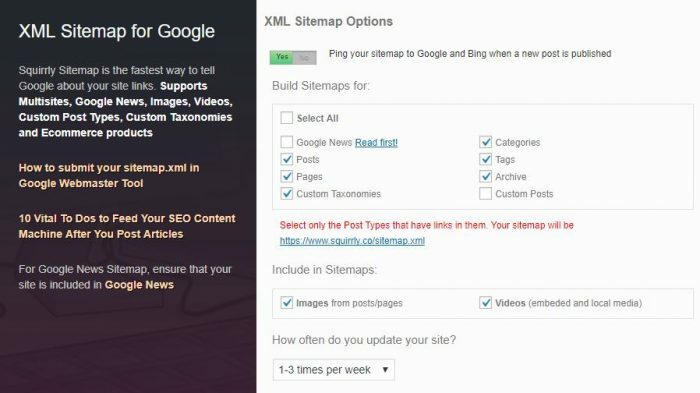 The sitemap is a file which includes a list of the pages on your site and how they are organized. This is an essential general guideline from Google which states you need to provide a page where you list all the important links in your site. Its importance relative to other pages on the site. One of the Squirrly SEO features is the XML Sitemap, which allows you to select which post types you want to include in the sitemap and also if you want to include images or videos. That way, you will help Google learn about the structure of your site and the content you publish. What’s also important when it comes to SEO and Google is to use the best keyword for your site, which will be easy to rank for. If you choose an extremely competitive keyword, then your post won’t rank high in search engine results, people won’t find your content and so it won’t have any impact. Google suggests thinking about the words your audience would use when searching for the type of content you want to create. If you don’t know where you can find these, then you can use the keyword research feature, which will give you plenty of keyword suggestions you can use in your article. With Squirrly’s Keyword Research, you can find keywords your site will actually rank for, without needing to spend months on doing backlink work. We check on a regular basis if Google has come up with new requirements or updated the ones it already had. Whenever something changes, Calin, our CTO, will start working on making the necessary changes, so that the plugin is compliant with Google’s guidelines. All the updates are documented on the WordPress directory. Besides making sure Squirrly meets Google’s SEO requirements, you can also measure your content’s success within the plugin. The Performance Analytics section and the weekly site audit will become your best friends and you will rely on them to see how your site is doing. You can find more details about the Squirrly SEO features here.